Camp Shelby Miss. 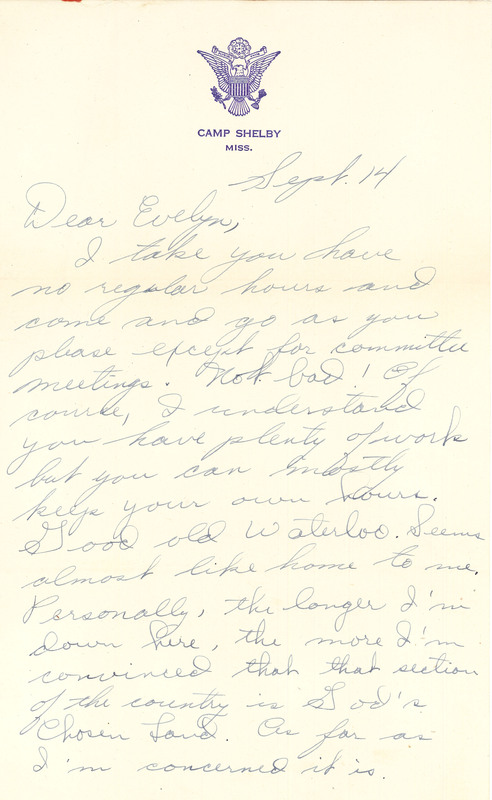 Sept.14 1942 Dear Evelyn, I take you have no regular hours and come and go as you please except for committee meetings. Not bad! Of course, I understand you have plenty of work but you can honestly keep your own hours. Good old Waterloo. Seems almost like home to me. Personally, the longer I'm down here, the more I'm convinced that that section of the country is God's Chosen Land. As far as I'm concerned it is.